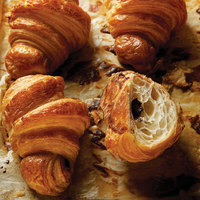 Beautiful homemade croissants, each containing a bar of high-quality dark chocolate, make for an impressive and indulgent addition to a breakfast spread. No matter how much chocolate you prefer inside your croissant, be sure to use a very good quality bar. Stir together yeast and ½ cup water heated to 115° together in the bowl of a stand mixer fitted with a dough hook; let sit until foamy, about 10 minutes. Stir in milk, sugar, 3 tbsp. melted butter, powdered milk, and salt; add flour. Mix on medium speed until a stiff dough forms, about 5 minutes. Transfer to a work surface and form into a thick square; wrap in plastic wrap and refrigerate for 2 hours. Place remaining butter on a sheet of plastic wrap; cover with another sheet. Using a rolling pin, pound and shape butter into a 6″, ½″-thick square; set aside. Using rolling pin, roll dough into an 16″ square on a lightly floured work surface. Unwrap butter square, and place on dough so its corners line up with the middle point of each side of dough square; fold dough corners over butter so they meet in the center. Roll dough into a 12″ x 9″ rectangle, and then tri-fold dough like a letter. Roll the dough into a 12″ x 9″ rectangle and repeat folding. Wrap in plastic wrap; chill for 30 minutes. Repeat rolling and folding dough twice more; chill for 1 hour. Roll dough into a 20″ x 14″ x ¼″ thick sheet; halve lengthwise. Cut each half into about 9 triangles, about 3 ½″-wide at their base; cut a ½″-deep slit in the middle of each wide base. Place 1 chocolate bar parallel to the base near the cut; holding the tip of the opposite corner down, roll the base over the chocolate toward the tip until it forms a tight roll. Place croissant on a parchment paper-lined baking sheet, tip side down, and brush with egg wash. Repeat with remaining triangles, bars, and egg wash. Let croissants sit until doubled in size, about 2 ½–3 hours. Heat oven to 375°. Working with one baking sheet at a time, brush croissants with more egg wash; bake until deep golden brown, about 20 minutes. Brioche, a butter-and-egg-heavy style of bread, is an accessible baking project that is well worth the effort. A whole raw egg is baked into the center of this braided Italian-style Easter bread, making the loaf as striking as it is delicious. Cured Spanish sausage and grated Parmesan add a gentle heat and nutty richness to this brioche. Already divided into rolls, the loaves are easy to share. Delicate shallots, tart preserved lemon, and fresh black pepper add intrigue to a batch of fluffy, buttery brioche buns. A classic brioche dough yields an excellent batch of donuts. Here, they're rolled in cinnamon sugar while still warm and filled with a decadent milk-chocolate ganache. The generous amount of eggs and butter in this classic French bread yields a rich, tender crumb and the most irresistible pillowy texture. Easter in Ethiopia is a meat-filled feast of lamb, chicken, beef, and injera after 56 days of eating only vegetables.